Our Levin factory is based in the heart of the Horowhenua in the lower North Island. It is a region renowned for its expertise in the diverse textile industry. All our products are manufactured at our factory to ensure we maintain the strictest control over quality and delivery. Whatever your needs, be it farming, hunting, fishing, adventure tourism, sports clubs or domestic use, we have a purpose built solution. With over 35 years in the business and many more years in experience our company directors compliment each other by combining their collective expertise in business, marketing, and technical direction, and innovative design. Together we form a proud Kiwi Company producing multitude of sock styles carefully constructed with our customers in mind. Should warm and comfortable feet be important to you and your customers, we would welcome the opportunity to discuss your needs. 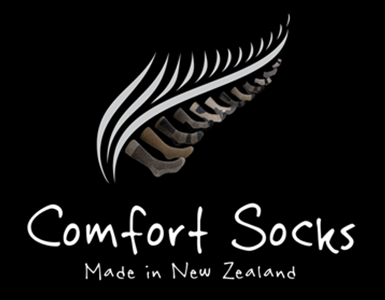 Comfort Socks are designed to meet the needs of our unique Kiwi lifestyle. From Cape Reinga to Bluff, we have your feet covered in Comfort!